and Brew Exchange to Drink for a Cause on November 12 from 5:30-9:00. 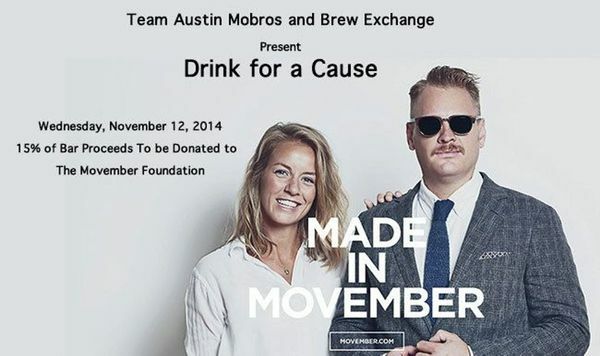 Brew Exchange will be donating 15% of the bar proceeds at Drink for a Cause towards Team Austin Mobros. Chavez Restaurant has provided a $75 gift card for one lucky winner. Please sign in when you get to the event for a chance to win! The Movember Foundation is the leading global organization committed to changing the face of men’s health. The Movember community has raised $574 million to date and funded over 800 programs in 21 countries. This work is saving and improving the lives of men affected by prostate cancer, testicular cancer and mental health issues.